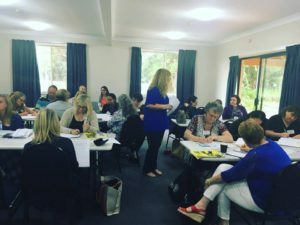 A Christian writing conference ~ Aussie style! Last weekend I attended the Omega Writers Conference in Sydney, Australia. I’ve travelled to the US four times for RWA conferences (2008 and 2014) and ACFW conferences (2013 and 2015), but there’s something special about attending conferences at home. Being in the same timezone as home, and not having to pay for expensive airfares, is a big plus. 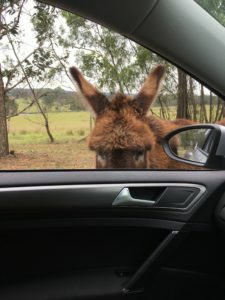 Thomas the donkey taking a look inside my car. We were welcomed to the venue at the Edmond Rice Retreat and Conference Centre by Thomas the donkey. He lives on the lane way and is just adorable. This year Hallee Bridgeman was our first international speaker from North America. It was great to catch up with Hallee and attend her two hour workshop on Writing a Realistic Christian Worldview. You can see a short three minute clip from her workshop on a video in my Facebook Profile. I discovered how to use Facebook Live at the conference. The highlight of my Facebook Live experience happened on Saturday evening during the CALEB Awards Ceremony. Catriona McKeown won the unpublished CALEB prize and she wasn’t able to attend the conference. Simon Kennedy (our past Omega President) called her on his phone, she answered, and he put her on speaker phone next to his microphone. Cate was so excited to win, and thrilled to watch the ceremony plus see her phone call via my Facebook Live recording. Kangaroos in Sydney, Australia, at Edmond Rice Retreat and Conference Centre. 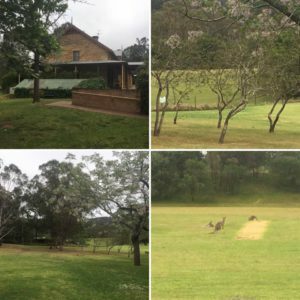 Our view each morning at breakfast included a herd of kangaroos grazing on the grass outside the dining room. My conference schedule was busy. I took part in a panel discussion with Rowena Beresford, Rochelle Manners, and Penny Reeve on the ‘Global & Australian Market’. I presented a two hour workshop with my author friend Andrea Grigg on Goal, Motivation, and Conflict. I taught the ‘theory’ during the first hour, and Andrea put our attendees to work in the second hour with a series of practical writing exercises. 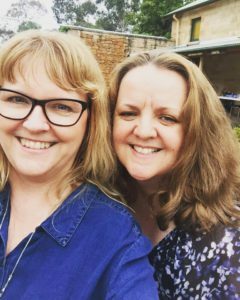 The Australasian Christian writing community is close knit, and we love having the opportunity to catch up with our writing friends, and make new friends, at conference. 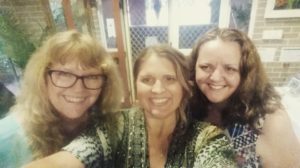 They are my tribe, and we work together to promote and support Christian writing in Australia, New Zealand, and beyond. We’re also real with each other, and we don’t have to put on our ‘perfect author’ face when we’re at conference. Prayer, laughter, and tears are a part of our authentic conference experience. The four Australian authors in ‘An Aussie Summer Christmas’ boxed set were all at the conference. Meredith Resce, our new Omega Writers President, was camera shy and managed to dodge numerous attempts to capture her image. You can meet Meredith in a short YouTube clip below from Omega Writers. Have you visited Australia? Is there a particular place in Australia that’s on your travel and/or reading wish list? I’d love to hear your thoughts and experiences. Hi Narelle, so great to read about an Australian Christian writers conference, how exciting. I thoroughly enjoyed the Aussie Summer Christmas collection, was so nice to read about familiar places. Favourite places in our beautiful country: too many to list here! I grew up in North Qld, went to Uni in NSW, now live in Victoria and have family in SA so have been privileged to explore some awesome places. The Blue Mountains are always a special place to visit and we love hiking in Tassie! Hi Wemble, Wow, you have travelled and lived in various locations around Australia! I love the Blue Mountains – so pretty :) Tassie is also on my travel wish list. I’m glad to hear you enjoyed reading ‘An Aussie Summer Christmas’. The weekend was encouraging, inspiring and awesome. Can’t wait to attend again next year and this time hopefully be able to contribute a book review etc. Hi Kathryn, It was lovely to meet you, and I’m so glad you enjoyed the conference. :) I’m looking forward to next years conference, too – the weekend flew by way too fast! 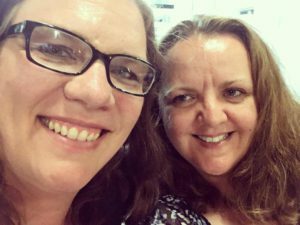 Hi Nacelle, thanks for sharing about your Omega Writers Conference in Sydney, Australia experience. I am glad you were able to connect with the writers of the Aussie Summer Christmas collection. One of the perks of attending a local conference. The only way I have traveled to Australia is through a book and a missionary friend. In August my Book Club for Foodies had an Australian adventure when we read Bill Bryson’s travel memoir In a Sunburned Country. Our local cooking school gave us a taste of Australian cuisine. With the background knowledge of Bryson’s book, I connected with the inspiring romances in An Aussie Summer Christmas. As a German American and retired German & English teacher, I delight in reading stories set in foreign lands. I enjoy learning about the customs, traditions, language, cuisine, history and points of interest of different countries. An Aussie Summer Christmas definitely covered all those areas. I would be delighted to see kangaroos in the wild. My best encounter with the unique creature was in my European adventures at the Heidelberg Zoo in Germany. Sorry! I was sure I typed Narelle! At times like this I dislike auto correct. With a German name, I try to be vigilant with people’s names. HI Narelle! No worries re. typo. I concluded that auto-correct would prefer to spell my name with a c when a number of people who wished me happy birthday on Facebook earlier in the year made exactly the same typo, lol. Hi Narelle! Thanks for sharing your experience at the Omega Writer’s Conference. It sounds like a lot of fun and a good learning experience. I loved all of the pictures, especially Thomas. I’ve never been to Australia, but I’d LOVE to go on day. Hi Jill, I hope you’ll have a chance to visit Australia! Our conferences are always fun and it’s nice to be able to fall asleep at a reasonable time. At US conferences I’m typically awake until 2 or 3am due to the time zone differences, and I drag myself out of bed in the morning (which is the middle of the night in Australia). I have always wanted to go to Sydney but fear of flying and a severe lack of funds keep me home rather than vacationing all over as I wish. I so want to see kangaroos especially little Joey ones. Hi Cassandra, Yes, it’s a long plane trip (15 or 16 hours if you take a direct flight from Dallas to Sydney). The kangaroos are cute. :) They’re also like deer, and we have to take care when driving at night. I took a long distance photo at the conference because kangaroos in the wild are very protective of their joeys. They’re known for taking action to protect themselves and their joeys if they feel threatened. It sounds wonderful! I want to come to that very writers’ conference sometime in the future. Hi Lee, Yes! Please visit our conference. It’s usually held in late spring (October) which is a lovely time of year to visit Australia. Me, too! I’ll come with Lee! And we’ll spend a couple of weeks touring around as well! My sis and her family were missionaries in Papua New Guinea for many years and went to Australia for medical issues and a couple of vacations during that time. Aus has always fascinated me. I would love to visit Australia some day. So many parts of it are on my wishlist. We’ll get over there some day. Hi Elizabeth, I’d love to see you here when you eventually visit. :) I’m the same with the US – there are so many places I haven’t had a chance to see during my many trips over the years. Narelle, it sounds like you had a fabulous conference. Going to Australia is on our list of places to travel. I’m hoping in 2018. Thank you for sharing your conference! I’ve never been to Australia, but I’d love to visit Sydney where your characters hang out. We’ve not traveled internationally, there are still so many places here in the states we’d like to see and experience! Thanks for sharing your conference fun! I had the pleasure of meeting Kara Isaac, sweet New Zealander author, in Nashville. I love connecting with fellow believers all over the world via the internet and in person! Hi Beth, I’m so glad you had a chance to meet the lovely Kara. :) The internet is definitely making it easier for us to connect and stay in touch. This sounds as fun as the ACFW conferences I’ve read so much about from our US authors :-) And it’s always fun to see pictures from these events. I didn’t realize there was something similar in Australia! Thanks for sharing the pictures and video clips, Narelle. 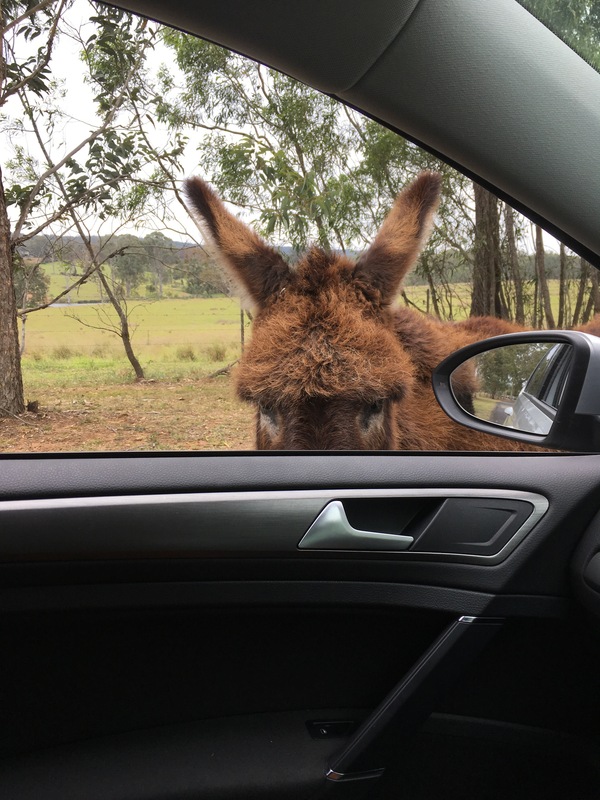 How fun to have a donkey greeter…lol! Was he super friendly? He sure looks sweet. Hi Trixi, Yes, ACFW conferences are so much fun. Our conference is a lot smaller than ACFW, and we’re in a rural location rather than a city hotel. Visiting family in NZ is a great plan, and you could stopover in Sydney on the way home. :) Thomas was very friendly and curious. I suspect he was disappointed that I didn’t have food in my car for him, lol. Thanks for sharing your experience. Australia seems like a wonderful place and I’ve had many friends traveling to either Australia or NZ in the past few years. What they’ve shared from their experiences has really motivated me.. now I just need the time and money (and convincing my husband, of course–we have so many places in our to travel list). Hopefully we’ll be able to do that one day.